Well, we liked this one. We weren’t quite sure on arrival though and I got “the face”. This was because a) the directions were a bit loose (the husband likes things to be measured in an accurate manner), b) we initially drove past the entrance and c) it wasn’t a Four Seasons. Not especially obvious, the entrance and a lot of steps. With a suitcase that was packed knowing there would be no penalty for being overweight, my heart sank. I did feel slightly better when I saw the sign tacked to the wall, which announced that their own home-made ice cream was available every day, on the terrace. I felt better still when a very strong and rather handsome man appeared, as if by magic (but in reality by artfully hidden camera) to take our bags, and us, to the check in. After the obligatory query about whether a larger room might, in fact, actually be available despite having been told not, in a number of pre-arrival phone calls (the answer was still no), we settled into our room. Small but perfectly formed, I think you’d call it. It does the job though. Familiar shades of F & B neutral and lovely fabrics. Good use of stripes and sisal. Not over-designed but the detail was there if, like me you notice that sort of thing. Clean. Spotless in fact. REN products, tick. Strong shower, tick. Good pillows, tick. I could go on but you get the picture. This was a good boutique hotel, which knows its market, makes an effort to be friendly and gets it right. I know it’s terribly Travelodge of me, but I would like some tea and coffee-making facilities in the room. I know, but there’s only so much that can be done without a strong cup of tea. Maybe there just wasn’t enough room for it.. I particularly liked the staff. Many women d’une certain age behind the reception desk, to make me feel at home. Quietly competent with a sense of humour. This is an hotel which knows its demographic. I suspect a lot of the guests have postcodes which start with SW. It’s trendy but not achingly so; it’s quietly superior without getting up your nose with it. There’s a little spa room (natch) and good, well-trained therapists for those days when it rains too hard and you just need to cocoon in the hotel. The food was fresh and simple and what I would describe as ” superior home cooking “. It was cooked with care. The menu changed daily and the star item was, as you would expect, fish and shellfish. Lobster can be ordered on demand as you wish, as indeed it was and delicious it was too, with a side order of chips and home-made herb mayonnaise. Portions are generous. We like that. The service is careful and thoughtful . They go for little touches – our hot water ran out one evening so the next evening they gave us a glass of champagne with dinner. 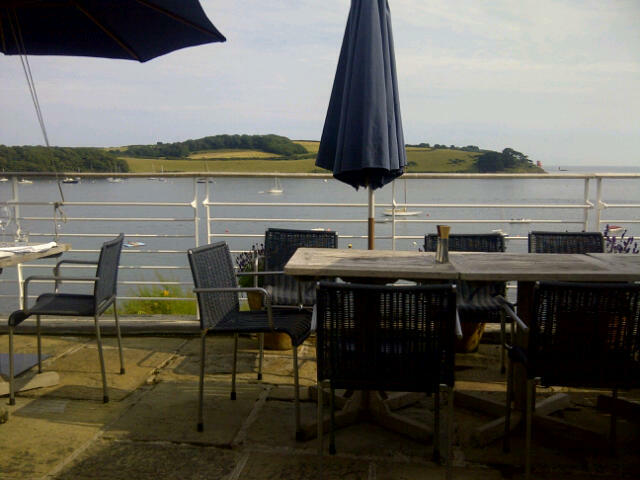 We managed to eat on the terrace on at least half a dozen occasions which is no mean feat in Cornwall . This is the view you get The patio heaters help. Good breakfasts. Lots of choice. My boiled eggs test was passed. Decent-ish coffee. 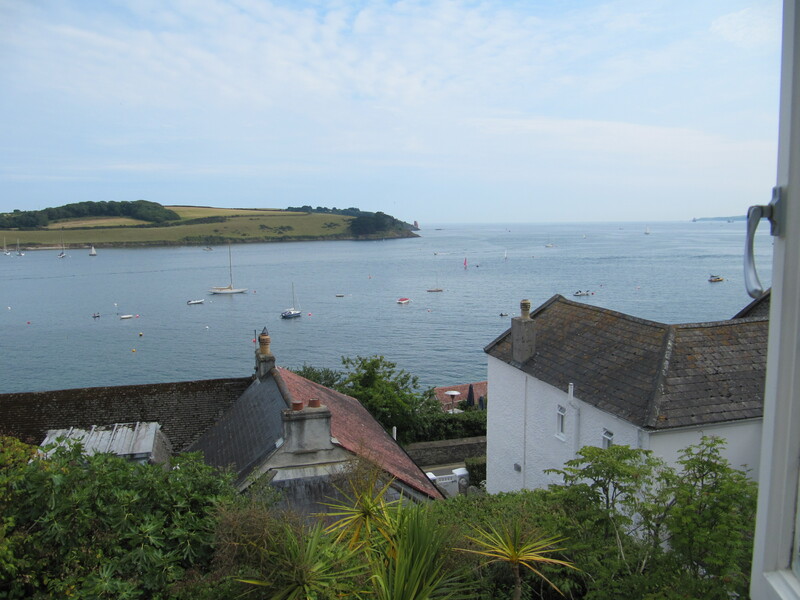 St Mawes itself is rather isolated from “trendy” Cornwall, although it’s very well placed. 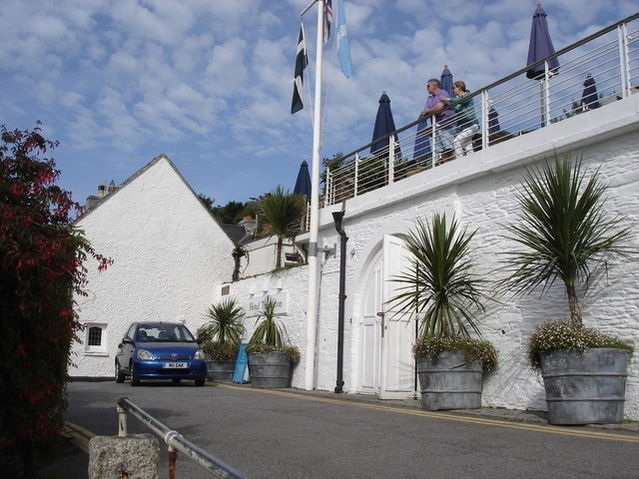 You could, if you were so minded, drive for an hour or so to “Padstein” as I believe it’s called www.rickstein.com or go to one of the uber-trendy beach cafes such as The Porthminster Beach Cafe in St Ives www.porthminstercafe.co.uk but we didn’t, preferring to stay put and not wanting to do the drive. I warn you, you need to drive for at least an hour to get to the big food destinations. If, like me, you have given up pretending that you’re not middle-aged and middle class, you can let yourself enjoy the gentle pleasures of the very interesting gardens and National Trust properties in the vicinity. I’m told that are lots of good walks, if you’re that way inclined. Which I’m not. articles. I’ll bookmark your blog and test again right here regularly. I am quite sure I will be told many new stuff right right here! Good luck for the next!